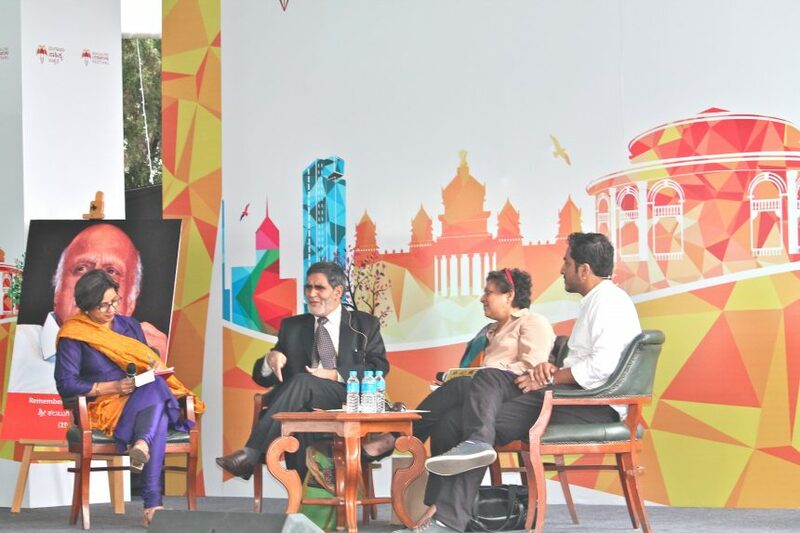 This session was bound to pique everyone’s interest, and translated into a wonderful crowd that gathered to witness this discussion, with Maya Mirchandani as its moderator. Haroon Khalid, Mohammad Zaman Azurdah and Padma Rao Sundarji constituted the board of panelists. Azurdah began the session tracing his precious relationship with Bengaluru all the way back to 1974. He went on to say that we are born as humans, it is only when you come to the last cycle of your life that you realise that you had this certain identity, which is more political than literary, and that some people often become goons just to establish their identity; some people are good just to establish their identity. He continued by saying that divisions are imposed onto us and condition us into a particular way of thinking. Padma Rao spoke about the civil war in Sri Lanka. She said that the ethnic identities are blurred in Sri Lanka, because the very definition implies various differences. There are religious identities, racial identities, linguistic identities, unlike in the West, where the differences are far fewer. Pan-subcontinental identity has always been the dominant identity in South Asia. That is the identity that colonial powers began to chip away at, and fracture. They went back to the old conflicts (Tamils vs Singhalese), they rejuvenated and brought them back to life through a series of moves known as ‘divide and rule.’ Outside determination to fracture that unity was more of the cause, rather than ethnicity. Maya Mirchandani went on to say that this very ‘divide and rule’ phenomena fuelled the concept of ‘separate-ness’. He went on to say that it’s not just the words, you observe their body language and their style of saying it – when someone from the minority says that they love the country that they’re living in. Khalid also feels that writing is much easier than documentary because it gives you much more flexibility. Mohammad Zaman Azurdah added that there are only two sects in our society – one is powerful, one is not. We have not been able to come out of the feudal system. People have, for their own purpose, given different names and distributed people into different sects. The session ended with an interesting question-and-answer round, with the audience joining in the discussion.